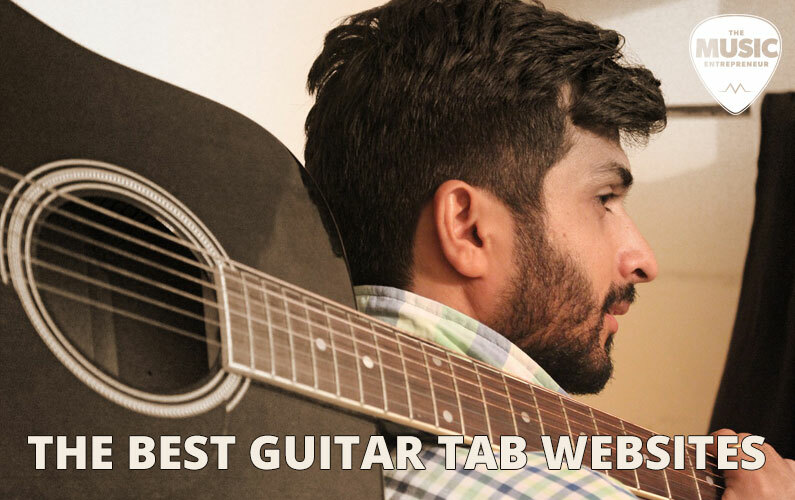 Summary: this post features the best guitar tab websites available. You will also find tools you can use to speed up your learning process and get more out of your practice sessions. Let me level with you – I play a lot of guitar, but there are only two sites I use to find tabs. I’d rather spend time playing my instrument than endlessly scouring the web for songs that people haven’t even created tabs for, wouldn’t you? And, despite the fact that new guitar tab sites come along all the time, I generally don’t find the need for them. Once you find something that works, you may as well stick with it. But don’t worry – I’ll tell you what I use – not just the sites I depend on for my tabs, but also what tools I use to read them (this is more important than you might think). Read on. If you’ve been a part of the guitar community for any length of time, you probably know about Ultimate Guitar Tabs already. But something you might not know is how to use it. And no, I’m not trying to insult your intelligence. Find highly rated tabs. Ultimate Guitar Tabs has a five-star community rating system for all their tabs. As much as possible, only reference tabs with five-star ratings. Also look for more votes rather than fewer. This is how you know whether the tab you’re looking at is accurate. Choose the right tab type. This is displayed in the column on the far right. If you’re looking to learn the guitar part, you shouldn’t select “bass”. Don’t choose “chords” unless you want a lead sheet for the song. Use “tab”. If available, download Guitar Pro or Power Tab files. I’ll talk more about this a little later. These are great programs that allow you to do more with your tabs than just look at them. But if you don’t have the software, downloading these files will do nothing. What I said about highly rated tabs also applies to these. Songsterr is still a relatively new site, but it’s starting to get more established now. It works a lot like Guitar Pro and Power Tab do, which is what I like about it. In other words, Songsterr is an online guitar app. Their tagline is “Guitar Tabs With Rhythm”, which is a nice way of describing what it is. Incidentally, it requires the use of Adobe Flash Player – so, it’s not exactly Mac friendly. But they have a large archive of tabs, and if you’re looking for any of the standard fare, like AC/DC, Guns ‘N Roses, Metallica, Nirvana, and Green Day, it’s all there. They even have some more obscure tabs – I’m a fan of Extreme and Harem Scarem myself, and was able to find find a few of their tabs on Songsterr (but more is always better). If you couldn’t tell already, I’m not much for software I don’t need, so if I can get away with using a website rather than a desktop application, I’m all for it. I’ve talked about the fact that I sometimes use Google Image Search to find practice and lesson ideas before, and this is something I still do. There’s a ton of content online. I think there are still many niches to be filled in the guitar lesson/tutorial space, but there’s no question that you can find more and more of what you’re looking for by the day. I’ve found that image searches can lead to interesting discoveries. You might be able to find the sheet music for songs you can’t find tab versions of. You may also be able to find riffs or little segments of music for particular guitarists or songs you like. These examples are easily digestible, which is what makes them great for practice and lesson ideas (if you’re a guitar teacher). Even if you don’t use it all the time, it’s nice to be aware of the fact that you can find interesting content using this method. What are some of the drawbacks of standard tab? There are several. For one, you can’t hear the tab. You can always listen to the song on YouTube or Spotify, but it can be hard to tell exactly how to play a passage of music without hearing the guitar part separated from the vocals and other instruments. Two, you can’t slow down music. To be fair, some music players and apps do this now (MooSick Music Player comes to mind), but if you’re trying to figure out a fast segment of music (via Al Di Meola, for example), it’s nice to have this feature. Three, you can’t change the tuning of the guitars. There’s no altering what’s been committed to tape, CD or MP3. But with Power Tab or Guitar Pro, you can take a guitar part that’s been recorded a half step down, for instance, and bring it back up to standard tuning. If you don’t have multiple guitars in different tunings sitting around your home, it’s nice to be able to do this. Power Tab. Power Tab as an application hasn’t been updated in quite a while, but it’s free and a great program to have, if only because there are plenty of Power Tab files floating around online. You can also use it to compose your own music and export it to plain text or MIDI later. Here’s a secret – I’ve used Power Tab to compose the keyboard or strings parts for some of my recorded tracks. Guitar Pro. Guitar Pro, unlike Power Tab, will cost you a bit of money. So, if you don’t have much of a software budget, you may want to put it off until you can afford it. But it’s safe to say it’s a more powerful version of Power Tab – in terms of reading and composing tabs, and playback capabilities. The reason I use both Power Tab and Guitar Pro is because it’s sometimes easier to find quality tabs for one program over the other. Again, Power Tab and Guitar Pro can only read proprietary Power Tab or Guitar Pro files. Ultimate Guitar Tabs is a great place to find and download them. Then, simply load up the files in the program that reads them. By the way, if you’re looking for a great list of guitar riffs to get yourself going, you can find some here. Books can also be a good resource for quality tabs, so if you can’t find something anywhere else, it might be worth looking it up on Amazon. Did you already know about these sites? Do you use others when you’re looking for tabs?